Europe’s traditional trucking giants are making huge investments in self-driving trucks in the hope that they can be the disruptors rather than the disrupted. But many in Europe worry that the U.S. retains a number of advantages — a giant market and fewer regulations — in the race to getting self-driving trucks on the road. Those long American highways and empty spaces make testing and development easier to do than in Europe. Although opinions are split as to which region has the clear edge, there’s agreement that the competition to stake a claim to be first with a technology that promises to revolutionize commerce is intensifying. And as that push accelerates, it has even evolved in some cases to cooperation among potential rivals. “There is a race between Europe and the U.S. right now,” said Torbjörn Holmström, senior advisor to Volvo’s Research & Technology Group. Volvo, which owns the Mack brand in the U.S., has its wheels rooted in both continents. In 2013, Volvo Group’s venture capital arm opened an office in San Francisco. And Holmström noted that Vovlo has partnered with Otto, the self-driving truck start-up acquired last year by Uber. The stakes for getting there first in the truck market are enormous. While much of the public is captivated by stories about driverless cars, analysts and economists believe the development and adoption of autonomous vehicles will be much swifter in the heavy-trucking market. The economics for the trucking industry in terms of cost savings, as well as enabling new services, is more compelling than for consumer vehicles. Drivers, for example, account for about 33 percent of trucking operating costs, according to John Larkin, an analyst at Stifel Financial Corp. Eventually, self-driving trucks will just be a set of wheels, a frame, an engine and a computer, he said in a recent report to investors. This will allow manufacturers to scale down the size and weight of the truck, allowing carriers to haul heavier loads and higher rates per trip, he said. 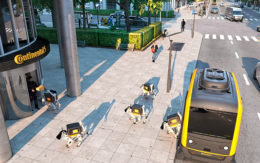 IHS Automotive analysts estimate that annual sales of autonomous heavy-duty trucks could reach 600,000 units annually by 2035, beginning with several thousand deployed in 2020. In a study released last summer, McKinsey & Company projected that by 2025, at least one of every three new heavy trucks will have high-level automation technology, which will be a big factor in the trucking industry seeing revenues increase 50 percent over the next decade. 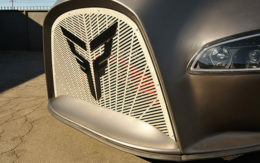 European truck manufacturers Volvo; Daimler Trucks, which owns the Freightliner brand in the U.S.; and Volkswagen have pushed relentlessly to develop autonomous trucking. These efforts were highlighted in the European Platooning Challenge last year, organized by Netherland’s government. Six trucks — one each from DAF, Daimler, Iveco, MAN, Scania and Volvo — last spring spent several weeks snaking through Sweden and Germany to demonstrate the potential of the technology to skeptical politicians and consumers. Early last year, Daimler staged its own demonstration of platooning in live traffic on a German highway. In late summer, Volvo followed suit with a dramatic test in a Scandinavian mine. And in January, Volkswagen’s Scania announced it had signed a deal with the Singapore government to implement what it says would be the world’s first full-scale autonomous truck platooning operations to ferry cargo between ports on public roads. That flurry of activity has not gone unnoticed. In a survey of supply chain executives released last summer, eft Supply Chain and Logistics Business Intelligence reported that European members were “more bullish on the technology” than their U.S. counterparts, with 59 percent of EU members expecting it to be part of their operations within the next decade. Of course, the geographical story of these European trucking companies is complicated. Though based in Europe, they are global, with different brands of trucks for various markets. Daimler has advanced engineering departments spread across the globe. Meanwhile, the U.S. isn’t totally silent. Navistar International Corp. announced last year that it was going to make a big push into autonomous heavy trucks over the next decade. But in the U.S., much of the attention has been drawn by start-ups. Uber surprised many observers last year when it acquired Otto, a start-up that’s making kits to convert existing trucks into self-driving trucks. Otto notched a major milestone when it made the first commercial delivery in October using autonomous trucks, though it used a Volvo rig. Analysts are predicting that Tesla will reveal more details of its plan for an autonomous semi early this year. But perhaps one of the best examples of how geographical divides blur in this market is Peloton, a Silicon Valley start-up developing autonomous truck technology. Founded in 2011, the company has raised $18.4 million in venture capital. Investors include Finland’s Nokia Growth Partners and Volvo. “While many companies have explored various forms of truck platooning on a research basis, we are the leader in bringing two-truck, driver-assistive platooning to market,” said Jonny Morris, a Peloton spokesman. The U.S. has another big carrot to draw those European companies across the waters: Space. Setting up live testing situations is difficult in Europe, where trials like the platooning challenge and the Daimler test had to seek a range of temporary exemptions from various governments. Volvo did its demo in a mine in part to avoid the bureaucratic thicket. In the U.S., Otto spent three months working with the state of Colorado to navigate regulatory issues. But many other regions are opening large-scale testing facilities. In 2015, the University of Michigan opened MCity, a 32-acre autonomous vehicle testing site that simulates urban and suburban driving conditions. Late last year, the state of Ohio announced it would spend $15 million to turn one 35-mile highway into a test ground for autonomous trucks. Even more notable is that Daimler has said it will be testing its autonomous trucks in Nevada, where the state granted it a license. The growth of these testing facilities is just one of many reasons European trucking companies believe the technology will likely be deployed in the U.S. first. That, in turn, has them investing more on research and development in the U.S. The regulatory situation also seems to tilt in favor of the U.S. Those European companies staged their very public demos to light a fire under regulators in the EU. And there are working groups at the European Commission and in various countries trying to develop a framework for autonomous trucks. While that work lumbers on, then-President Obama in September released federal guidelines for self-driving trucks. The National Highway Traffic Safety Administration must still make rules for the country’s highways. Pfeifle said Daimler believes the regulatory environment will fall into place much faster in the U.S.
Of course, there are still several other variables to solve and where neither side appears to have a clear advantage. Trucking companies would like blazing-fast 5G wireless networks to be in place, something that is largely out of their hands. And in some cases, new road infrastructure will be needed, either to accommodate trucks as they exit a road or special parking areas where they can get inspected and refueled. Still, Matthias Kaesser, the lead author on last year’s McKinsey report, is optimistic that one way or the other, both regions are going to be part of this revolution. Editor’s note: Staff writer Clarissa Hawes contributed to this article, which was reported and written from Toulouse, France by Chris O’Brien, European correspondent for Trucks.com.